Join Our Certified Community Driven Network - MTM, Inc.
Do you have your own car? Can you spare a few hours a week to help members of your community safely travel to their healthcare services and live healthier lives? Every day, MTM transports thousands of passengers who have no other way to get to their medical appointments. 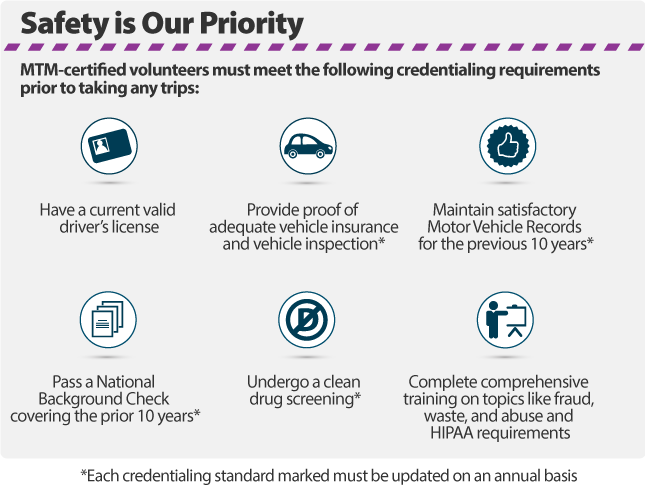 Certified Community Drivers are an important component of our operations, helping us achieve our mission of reducing community barriers and increasing access to healthcare. 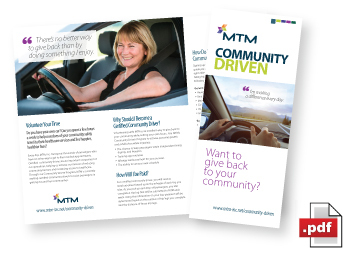 Through our volunteer program, Community Driven, MTM is currently seeking volunteer drivers to assist passengers in getting around their communities. Volunteering with MTM is an excellent way to give back to your community while setting your own hours. For every trip you complete, you will be reimbursed based upon mileage. If you’re interested in pursuing the rewarding task of volunteering with MTM, fill out the form on the right. An MTM recruiter will contact you soon to discuss opportunities in your community. You could be taking trips in as little as two weeks! Help MTM become Community Driven and join our network of volunteers to connect with passengers, create lasting relationships, and remove community barriers. Volunteering to drive is truly an act of altruism; our Certified Community Drivers are dedicated to giving back to their community. In many cases, volunteers are seniors themselves who enjoy driving and are seeking a way to remain active in their community while helping others.